View Magento 2 version here. Fully customise order, invoice, shipment and credit memo numbers using any combination of letters, numbers and dates/times. Choose to use the same number for order, invoice, shipment and credit memo numbers (when a new invoice, shipment or credit memo is created, it will take the same number as the associated order). For example, for order #1000, the associated invoice would be #1000, the shipment #1000, and the credit memo also #1000. This is a simple and popular approach for tidy record keeping and easy document identification. One license per Magento installation, including multi store setups and test sites. Easy! Check out installation instructions, User Manual and FAQ over at the Support Centre. Installing this Magento extension requires a moderate knowledge of website maintenance. If the installation instructions look too scary, select professional extension installation at checkout (or from here if you've already ordered your extension), and we'll install the extension for you. Free extension updates are available for 12 months after your initial purchase. When a new version is released, the file will be available to download from your account on the Fooman website, under “My Downloadable Products”. Below, you can find answers to questions you might have about the extension functionality, and common questions asked by customers before they purchase the extension. Do you have a general question (eg. about licensing or your account), or a specific troubleshooting issue? Check out our Help Centre. Can I change my existing orders numbers from before I started using this extension? You can only customise new order numbers. It is not possible to change existing order numbers, as these have already been communicated to customers and in many cases, used for accounting purposes. How do I continue an existing numbering system? As well as starting a new numbering system, you can also continue an existing numbering system, using a more streamlined format. For example, an order number of 1005001 under the existing numbering system could become ORDER-5001, 2012/10-5001 (or another combination) in the new numbering system. Which Magento order number does the extension customise? Custom order numbers will apply to order numbers visible to the customer (increment ID). The standard Magento internal database identification number is left unchanged. Are there any known conflicts between Fooman Order Number Customiser and other Magento extensions? There is one small limitation with using Fooman Order Number Customiser with iDEAL (Dutch payment processor) - see the related FAQ below. There are no other known conflicts between Order Number Customiser and other Magento extensions. Is Order Number Customiser multi store capable? Order Number Customiser is fully multi store capable - simply configure different settings for each store set up. Can I use Fooman Order Number Customiser with iDEAL (Dutch payment processor)? Yes, however please note that your order number can only contain numbers and letters. 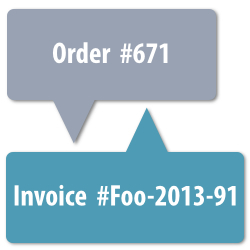 If I want to use the same number for order, invoice, shipment and credit memo numbers, do I need to use the Fooman Same Order Invoice Number extension as well? 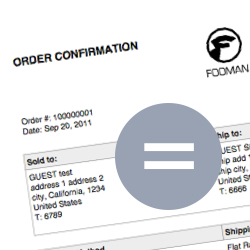 This is a feature of Fooman Order Number Customiser, so there's no need to install Fooman Same Order Invoice Number as well. This is a great and very, very useful Magento extension.